Name list of mountains in Bali island and volcano in Bali Indonesia, apart as a tourist island which has beautiful beaches and unique cultures, Bali island also has several mountains and volcanoes. Below is the name list of the mountains in Bali and volcanoes in Bali island, Indonesia. The volcano and the mountain in Bali Indonesia are also well known by local climbers or foreign climbers as favorite destinations for climbing and trekking or hiking when they spend the holiday in Bali. Mount Agung is Bali's highest mountain (3,142 m). It lies in the central-eastern part of the island of Bali, situated in Karangsem Regency. Geologically, Mt. Agung is an active stratovolcano, and has had significant eruptions during the past, most drastically in 1963. Since the last eruption in 1963 until in the year of 2017, there was no visual volcanic activity, it can be said that Mount Agung was sleeping during those years. 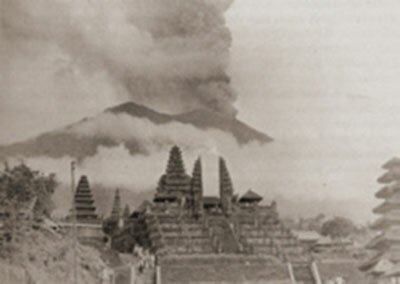 Agung erupting on Bali in 1963, with Besakih Temple in the foreground. The eruption of Mt. Agung caused a great deal of hardship and suffering on Bali during and after 1963. The volcano had not previously erupted during recorded history. The eruptions occurred during the performance of the once-a-century Eka Dasa Rudra religious ceremonies in Besakih Temple. In 2017, ffter encountering a mass (series) of volcanic earthquakes throughout September and October 2017, on November 21st, 2017 on at 17:05 of Bali time an eruption appeared first at Mount Agung. 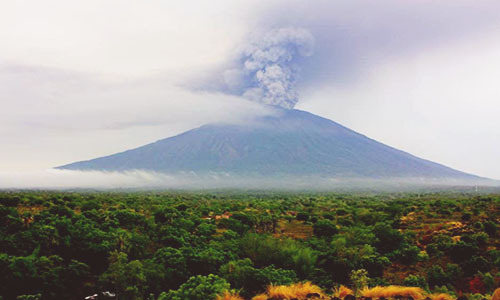 According to MAGMA Indonesia, this eruption generated volcanic ash and gas that went up to heights of 700 m (2300 ft.) above the peak (12,000 ft. above sea level (ASL). Over the following period, the elevation of ash columns raised as follows: 25 November, 2017, at 17:20 of Bali time, 1500 m above the point (15,000 ft. ASL), 26 and 27 November 2017, 3000 m (20,000 ft. ASL), 28 November 2017, 4000 m (23,000 ft. ASL). Then on 29 November 2017, the ash column level dropped to 2000 m above the peak (16,000 ft. ASL). These kind of ash columns were gray in color and released ash-fall in downwind locations. Since 30 November 2017 and ongoing until 2 December 2017, the column was white in color and also has had an optimum height of 2000 m above the summit (16,000 ft. ASL). Lahars have occurred since the ash eruptions started out on 21 November. They have flowed down from the peak along waterways in the southern area of the volcano, which include Tukad Yehsa, Tukad Sabuh and Tukad Beliaung along with in the northern region including Tukad Bara. All these lahars have not led to fatalities. However, lahars have affected houses, roads as well as agricultural fields. In the year 2018, Agung still having its volcanic activity and is still being monitored. 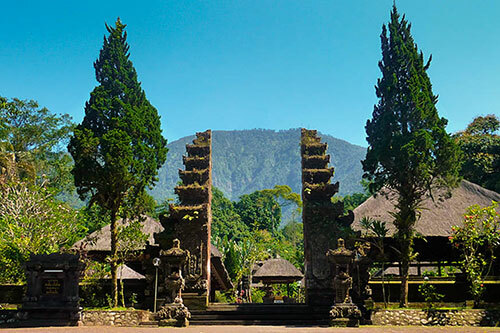 According to the Balinese Hindu religion, Agung (Gunung Agung in Balinese and Indonesian) is the most sacred mountain in Bali and it is home to Bali's largest temple, Besakih Temple. Agung volcano is very popular with mountain climbers and trekkers, and it's very famous for sunrise trekking but because of its difficulty, is far less touristy than Batur. Mount Batur (Indonesian: Gunung Batur) is a small stratovolcano in north-central of the island of Bali located in Bangli Regency. It consists of some craters and is 1,717 m high. Mt. Batur lies inside a big caldera, the leftover of a cataclysmic prehistoric eruption of a volcano which was previously over 4,000 m in height. Batur volcano continues active to this time and has erupted over 20 times over the past 2 hundreds of years. Huge eruptions have happened in 1917, 1926 and also 1963 (the exact time as Agung's big eruption) causing Batur volcano is Bali's very active volcano. 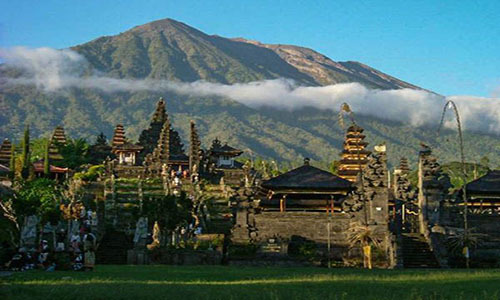 Batur is a favorite trekking as well as climbing mountain among tourists and adventure seekers and being popular attractions for trekking in Bali. Batur is well-known for the sunrise trek since its top is free from forest covers, gives the gorgeous sights and quite easy to access. The word "Batur" generally represents the whole caldera, which includes Mt. Abang, Bali's third-highest peak, that is set along the rim. Mount Batukaru (Indonesian: Gunung Batukaru), it's also spelled Batukau or Watukaru is Bali's second-highest mountain (2,276 m), situated in Tabanan Regency. Batukaru is derived from the Balinese words "Batu/Watu" means "stone", and "Karu/Kau" means "coconut shell". 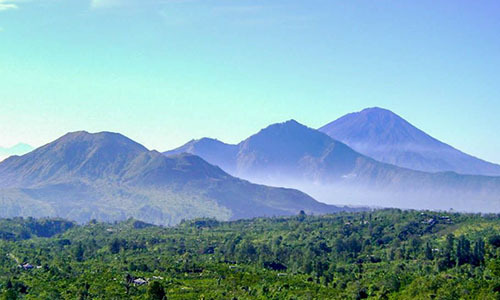 It is the maximum peak in the Bedugul volcanic region, but it is inactive. Mt. Batukaru is worshiped by the local people and contains a temple, named Pura Luhur Batukaru Temple. Batukaru is fairly unpopular with climbers since it is full of the dense forest which limits the scenery. Batukaru has actually a big crater, the largest in Bali Indonesia, however, this crater is wide open at the southern part of it, enabling the stream Yeh Mawa to flow. Mount Abang (Indonesian: Gunung Abang) is 2,152 m high, it is the highest natural point on the Batur caldera's rim, the third-highest in all over of the island of Bali, located in Bangli Regency and It is situated on the eastern side of Lake Batur (Danau Batur). Abang was previously part of the earliest Mt. Batur, but once this 4,000 meter's volcano had a massive eruption in prehistoric periods, it remains nothing less than a vast caldera along with the small cone. Mt. Abang is not a common peak among hill climbers, even though it is not a tiring climb. Mount Adeng (Indonesian: Gunung Adeng) is a dormant stratovolcano in the Bedugul volcanic range. It has an elevation of 1,826 meters which is located in Tabanan Bali, Indonesia. Mount Lesung (Indonesian: Gunung Lesung) also known as Lesong is an inactive stratovolcano in the Bedugul volcanic area, within just the southern of Lake Tamblingan, present in Buleleng Regency. It has a vast crater at its top, around half the size of Mt. Agung. Lesung's topmost peak is 1,860 meters above sea level. Despite the fact that Lesung has actually been climbed, trekkers typically prevent the lengthy trek by way of the lush jungle to get to its top. Mount Catur (2,098 m), often spelled Catu and Balinese people used to call it Puncak/Pucak Mangu, is the peak point along the rim of the Bedugul volcanic caldera, as well as the fourth-highest in Bali Indonesia and it's located in Tabanan Regency and also Badung Regency. It is situated in the eastern part of Beratan Lake and is favorite among climbers and trekkers, even with the large forest that covering it. The Balinese Hindu Temple (Pura Pucak Mangu Temple) is also located here. Mount Lempuyang (Indonesian: Gunung Lempuyang), also referred to as Bisbis/Belibis Hill or Mt. Seraya, is located in Karangasem, at the most eastern part of Bali island, within just the eastern of Mt. Agung. The peak, at 1,058 masl (meters above sea level) is on the southern side of the caldera. The Lempuyang Temple (Balinese: Pura Luhur Lempuyang), considered one of the nine directional temples of Bali is positioned on the western slopes of Mount Lempuyang. Mount Sanghyang also identified as Sengjang or Sengayang is an inactive stratovolcano in the Bedugul volcanic part. Its entire elevation is 2,087 m and situated in Tabanan, it Bali's sixth-highest mountain. Sanghyang is nearly totally excluded by climbers caused by its inaccessible position in the north of Mt. Batukaru, west of Mt. Adeng and Mt. Pohen, as well as in the south of Mount Lesung. Mount Prapat Agung is a little mountain on the peninsula at Bali's north-western end. 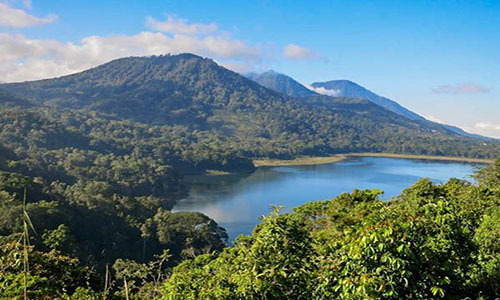 It is a natural part of West Bali National Park which is 310 meters in height, located in the district of Buleleng. Prapat Agung contains mostly of limestone, which makes it certainly one of the 3 areas on the island providing limestone (the rest are the Bukit Jimbaran and also Nusa Penida). Mount Pohen/Pohang (Gunung Pohen) is a dormant stratovolcano in the Bedugul territory, situated in Tabanan Regency. It is located in the southwest of the region of Bedugul itself. Its elevation of 2,089 m causes it to become the fifth-highest peak in Bali. Mount Kelatakan/Klatakan is 698 meters high, situated in Jembrana Regency, western part of the island of Bali. Mount Sangiang is located in Jembrana total height is 1,004 m.
Mount Merbuk is situated in the Regency of Jembrana Bali and its height is 1,356 m.
Mount Mesehe is 1,300 meters high, situated in Jembrana Bali. Mount Ngandang is situated in Jembrana Regency and its total height is 622 m.
Mount Mundi is in Klungkung Regency, its height is 529 m. Klungkung only has one mount in its territory. Mount Penulisan is also called Bukit Penulisan, its heigth is 1,745 masl, located in Bangli Regency. The famous and sacred Balinese Hindu temple (Pura Pucak Penulisan Temple) is also situated here. Mount Sidemen is 826 meters high with the location is in Karangasem Regency Bali. Mount Banyu Wedang is situated in Buleleng, its total height is 430 m.
Mount Patas (1,414 m) is located in Buleleng Regency. Mount Lok Badung is 1,028 masl, situated in Buleleng. Mount Kutul is located in Buleleng with total height is 842 m.
Mount Silang Jana (1,903 m) is also situated in the area of Buleleng.